AN OPEN LETTER FROM CORAZON DEL PUEBLO TO THE COMMUNITY AND BEYOND. It is with great sadness and grief that we announce that after serving the community for 5 years, Corazon Del Pueblo will be forced to close its doors on the anniversary of its opening. We want to thank all our supporters from the bottom of our hearts for all of your contributions over the years. It has been a beautiful struggle to sustain the space, ever since Metro LLC Inc., who owns the building raised our rent $100, we struggled even more. They gave us many chances before charging us late fees. Then we struggled even more to catch up. They threatened us with eviction notices, and now have filed a civil suit against our board members. Our attorney has been fighting this case and as of yesterday we have now reached an agreement to no longer stay and settle out of court. In order to end our lease without further legal fees from the corporation’s lawyer we decided to settle and pay $1,800 due this Monday December 8th, 2014. In order to raise the $1,800 we will be hosting a brunch tomorrow December 7th, at Corazon Del Pueblo from 11-4pm. It is important that we raise the $1,800 so as to avoid further court fees. We ask for everyone to please come out and donate what you can. Doors at our current location will be closing Saturday December 13th. Corazon Del Pueblo refuses to let this movement of the Arts, Education, and Action be shaken by this unfortunate circumstance. We will continue our programming out of our sister centers. We will be finding a new location and will continue to serve the just cause of the people. There will be more information to come on this. 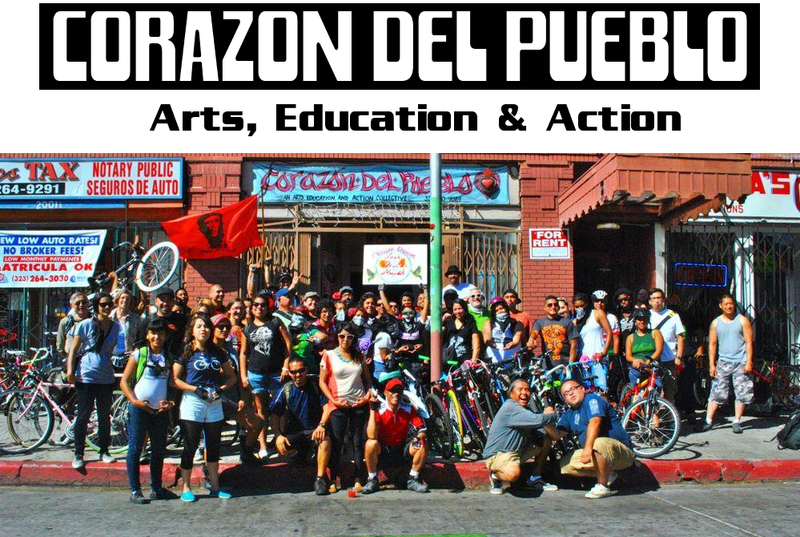 Corazon Del Pueblo has served the working class community of Boyle Heights with quality innovative programming, classes and workshops that have challenged our minds, provoked our thinking, inspired our souls, and enriched our lives. Corazon has served as a healing space, our dance hall, our Baby Shower Salon, a forum for hearts to speak in poetic prose and in painful yet hopeful prayer. It has served as a food kitchen providing free meals to our neighbors on holidays. 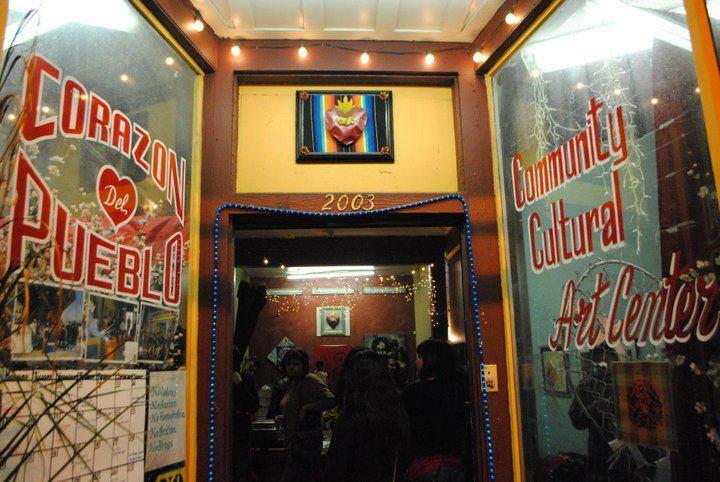 Corazon Del Pueblo has been that small place on 1st street that has echoed the message of both Love and Resistance. It is a place where people have met and married, a place where we have said good bye to our dead, where organizations have been born, it has served as a domestic violence shelter, a home to the homeless, a place of protest, it has been a platform for Peace, a healing circle, a place where the flowers break through the concrete, has inspired other organizations and businesses, but most of all Corazon Del Pueblo has proven beyond a doubt that through the combined force of love and our duty to serve, we can improve the quality of life of our neglected communities. No one else reflects this example better then all of our instructors, volunteers, and supporters. Our instructors have given their time, courage, hearts, and proved to all of us that with the simple act of service you can build a classroom, a program, develop a curriculum, and have it grow into a neighborhood run university. We are so greatly in debt to our instructors who have helped maintain the space, collect donations, teach day in and day out, we so greatly want to thank you from the bottom of our hearts for this beautiful sacrifice. You took a room full of eager and hopeful faces and made them thriving students. We would like to also thank all of our volunteers and supporters. Without your support and investment in the vision to self determination and a communities right to dream this would not have been possible. To all of you who donated supplies, took the trash out, helped facilitate a workshop, attended an open mic, helped us sign people in, moved a chair, donated books, we thank you with our highest gratitude.